Find My Workspace lists over 95% of the business centres market in Caerphilly. Simply click Request Quote to check pricing for one office, or Add to Basket for multiple offices. 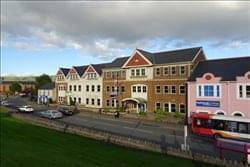 The building is a four storey modern office building in the centre of Caerphilly with secure basement parking. The building has been renovated with a new kitchen on every floor, new carpets, ceiling tiles and fully decorated. Each floor has been designed for open plan and separate office space. Ideal for space planning. The building has raised flooring, suspended ceilings and metal double glazed sash windows. Based on the outskirts of Cardiff, this centre is comprised of three modern buildings and is home to over 200 innovative, creative businesses. The centre boasts 60 modern, sleek offices for your business to thrive in, allowing you to have your own workspace, or engage in the creative, collaborative sense of community that thrives throughout the centre. Tenants can also make use of a lightning quick 400-mbps broadband, wireless access throughout the centre, wired connectivity and power at each workstation and a linked WiFi network throughout the three buildings. Membership also includes access to a range of business workshops, tailored mentoring and social events. Other amenities include meeting rooms, dedicated call handling, free water, tea and coffee, an onsite coffee shop and restaurant, 24/7/365 access and kitchen facilities. To obtain information for your selected Caerphilly Business Centres, please tick the "Add to basket" box for each office you prefer and complete the form below. We will then send a detailed report via email.